A few days ago I had a three-way telephone conversation with Michel Boisier and Jose Rosemblut. In one of my turns I asked Jose about his musical influences, as he paused for a moment to think about his answer, he repeated to himself "influences", then I heard Michel's voice in the background saying "Ah? Influences' Tell him we belong "to the spirit of the Woodstock generation" I thought that this is a sincere and clear answer and could be a great metaphor to explain the reasons behind the appearance on the Chilean scene in the late 50s and early 70s of bonds as free and outstanding as "Los Jaivas" "Slops". 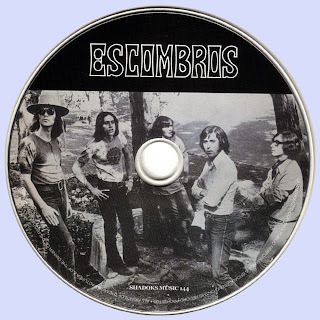 'Kissing Spell" and of course "los Escombros"
Jose and Michel met and created their first group "Colored Soap" to which Michel brought two North American friends - John & Matt, who were living in Santiago as they were the children of diplomats - and Jose brought Lito Benito. For a while the five of them played together until halfway through 1968. when the two Americans had to go back home it was just after that first setback when the "spirit" appeared for the first time, and m the wake of this disappointment they decided to stay together and introduce a new second guitarist to the band. Ricardo Mendeville (Lolin). 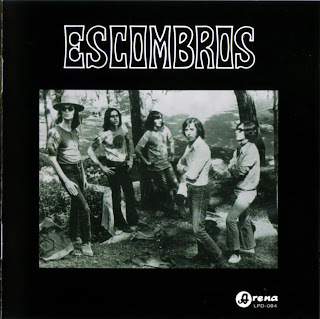 So, after they got over the setback, they finally named themselves "los Escombros" (which means rubble or debris in English, in other words, dispersed elements after the catastrophe! upon Michel’s initiative Things started to go extremely well, thanks to one of those great secrets behind the creation of marvellous bands play, play and enjoy. It was precisely at one of these performances where they met Walter Sitzmann, an Austrian who had recently arrived in Chile. He connected very well with them and their music and quickly became another "Escombro" member and contribute his ideas to the group Now as a five-piece band, the group began performing at every possible venue and giving some outstanding shows They hove started playing cover versions of "Grand Funk Railroad". "Led Zeppelin" "Conned Heat" and "Jimi Hendrix" But soon they ve added a large number of own compositions to the program which the audience connected with really well (From what I hove been able to read in venous magazines from that time, most of the performances were always booked out, no matter if they were playing alone or with other bonds together at different festivals and concerts which big groups of the time - such as "Aguaturbia", "Los Tropos" and "Kissing Spell'- and the connection was brilliant). So the complete line up of the band was Lito Benito on lead guitar (several members of the band have all agreed in telling me that he was an especial talented musician) the youngest member Ricardo Mendeville (Lolin) alternating between second guitar and organ and Jose and Michel on the bass and drums respectively, making up a strong Rhythm section. On top the band had a very interesting and exotic frontman Walter Silzmann, who wrote many songs and sang with great personality and even more, in "perfect English". Under Allende's government, the country was culturally successful, with a young society that enthusiastically look part in the progressive hippie movement. However, on the organisational side perhaps things where not as good and without a doubt both, the company 'Arena" where they recorded - over 4 night shifts on a simple 4 track - an LP and subsequently a single "love Machine / Green Eye Lady' (both tracks are included in this edition). and the scarce music press that were around were incapable of promoting sales property That is why today the record is so rare and difficult to find, this poor distribution did not happened to others groups of the same music style And Escombros were not exactly a band of the minorities. At the end of this fantastic musical journey. Walter had to return to Vienna, so the group split up and each member was going their own way Michel and Lito together with Sergio del Rio (Ex Jockers and Carlos Eduardo Reyes (The future keyboardist of Boney M!!) formed a group, which unfortunately lasted only o short lime, by the name of "Masquenunca"
After that Lito continued with "Miel" and then travelled to several different places. He ended up becoming genuine master at making guitars (luthier) He went on to live in the United Stales working for the guitar manufacturer "Taylor at upon his return to Chile set up his own company Jose continued in music as a session musician for the Brazilian artist "Manduka and the as guitarist of 'Antonio Restucci". I don't wont to miss out the curious anecdote that took place on a flight between San Francisco and New York. He travelled with Soft Machine and one of their greatly admired musicians, Hendrix himself, who he had the opportunity to chat with and was able to confirm the truth of two myths how accessible and friendly he was in person and the attraction he had for groupies! Apparent halfway through the journey while the film "Mary Poppins" was showing on the plane right there, on an improvised bed, using the seals of the plane, he made it with o beautiful admirer. Finally. 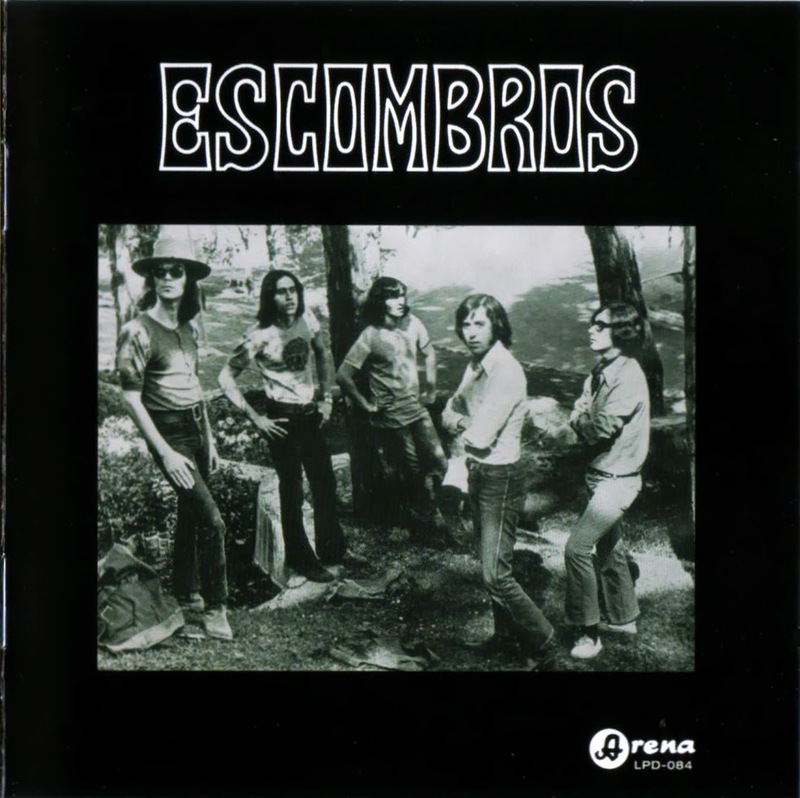 Ricardo Mendeville (Lolin), who was the first "Escombro" we where able to locate for this great project, left Chile shortly after the Military Coup (September 1973) He sold his "Leslie" amplifier from his Hammond organ" bought a boat ticket and came to Europe, where he lives ever since In Holland he formed the very interesting group 'Amankay" and after finishing his studies in classical guitar in Rotterdam he started, together with his teacher Paco Pena, the Flamenco Guitar department of the Rotterdam! Conservatory, where he works today. Walter is continuing to produce his music in Vienna. Austria and recently has finished recording a double CD called SITZMANN Heartbreakers & Soultakers'. He still continues to be inspired by classic rock where the marriage of melody rhythms and sincere words continue to be the main motive to transfer true feelings hence the "spirit of Woodstock” lives on. My admiration goes to all five of them and I hope that their "spirit' lives on today in all the people who listen to their great songs. After a string of pop hits that were, and largely remain, underrated for their artistry, Chad Stuart and Jeremy Clyde were looking for the project that would boost their esteem beyond the teen idol level. Releases like Pet Sounds and Sgt. 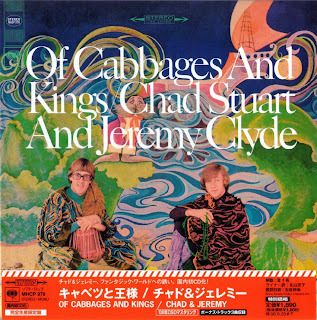 Peppers had raised the bar for pop production considerably, and in September of 1967, Chad & Jeremy entered the studio to create their response, Of Cabbages And Kings. 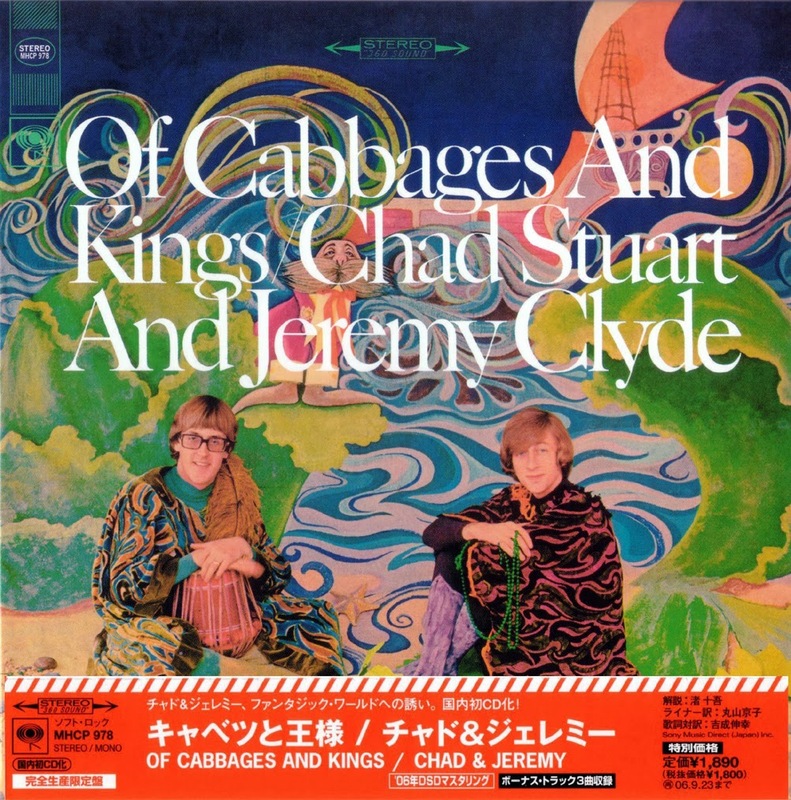 Although the album didn't have the commercial impact the duo hoped for, it has stood as one of the underrated gems of 60's pop. Sundazed has assembled the original album's six bonus cuts for reissue, and it's a reissue that should delight any fan of Brit-pop who is familiar with it, and happily inform those who aren't. Producer Gary Usher ran interference with the Columbia accountants, providing Stuart and Clyde the time and resources they needed to realize their ambitions, and their ambitions were high. Using sounds ranging from didgeridoo, horns and strings to flushing toilets and the verbal antics of their labelmates, The Firesign Theater, they produced a set of original songs that included the five movement "Progress Suite," a collage of music and found sounds. 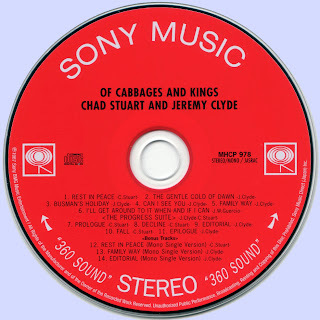 The result was an album worthy of inclusion in the pantheon established by its noteworthy predecessors, but ultimately it wasn't the album Chad & Jeremy fans were looking for, and save for the relative handful of us who revered it both then and now, it became best remembered more as a novelty near the end of a career (they would record one more album, the similarly ambitious The Ark, before Clyde departed to pursue an acting career on British stages) than as a triumphant peak.